It’s not surprising to know that there are some who confuse rotation with revolution. Although similar in concept, these terms in the realm of physics are not interchangeable. This article seeks to explain how and why. An object’s circular motion around a fixed center or axis An object’s circular motion around an external point or another body. A rotation is a circular motion of an object around a fixed point or center of rotation, even if it’s imaginary, is called an axis. In astronomy, rotation is a commonly observed occurrence. Planets, stars, and other similar celestial bodies are all in constant rotation on their axes. The rate at which the planets rotate was first measured by recording their observable features. The angular rotations of stars are measured through the Doppler effect and by tracking active features on the surface. The Earth rotates around its axis from west to east and causes the different time zones across the countries and continents. The parts of Earth facing the sun experience day while the other half facing away from the sun experience night. 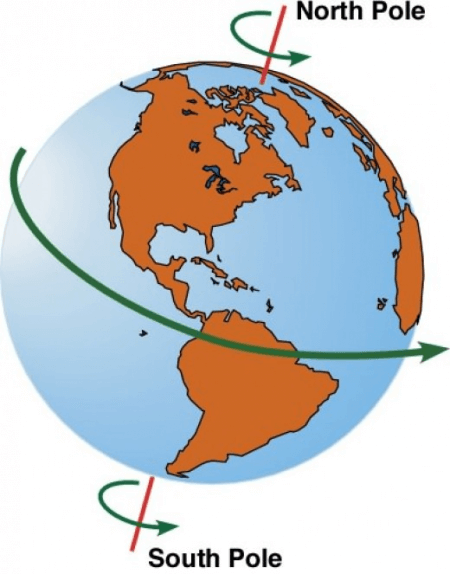 The Earth’s rotating motion is also known to cause a phenomenon that causes a slight “wobble” as the planet rotates on its axis. In addition to causing day and night time, the rotation of Earth is also known to affect the planet’s shape, tectonic movements, and ocean depths. The revolution of the Earth refers to its movement around the center of our solar system, the sun. This movement around the sun covers a 1-year period which causes the seasons to change. As the Earth revolves around the sun, whichever hemisphere is closest to the sun experiences summer, and the hemisphere farthest to the sun has winter. 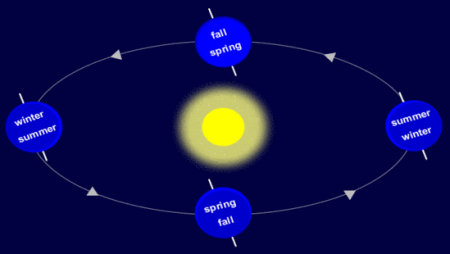 There is autumn or fall when both hemispheres are equidistant from the sun. Earth follows an elliptical path as it revolves or orbits around the sun. This explains why our planet is sometimes nearer or farther in relation to the sun which causes the different seasons. So what’s the difference between rotation and revolution? Rotation is a circular motion of an object around a fixed axis. The term is also applied to the circular motion of Earth on its axis. On the other hand, the earth’s movement around the sun is called a revolution. A revolution is also referred to as an object’s rotation around an external point. While our planet completes one rotation every 24 hours, one revolution around the sun takes 365 days. The different time zones are caused by Earth’s rotation on its axis. The changing seasons are brought about by the planet revolving around the sun. Here’s an instructional video showing how rotation is different from revolution.